1.1 This test method covers the determination of the resistance to abrasion of hosiery garments using the Martindale abrasion tester. 1.2 This standard does not purport to address all of the safety concerns, if any, associated with its use. It is the responsibility of the user of this standard to establish appropriate safety and health practices and to determine the applicability of regulatory limitations prior to use. 3.1 For definitions of other textile terms used in this test method, refer to Terminology D123. 3.2.2 courses, n—in knitted fabrics, the series of successive loops lying crosswise of a knitted fabric, that is, lying at right angles to a line passing through the open throat to the closed end of the loops. 3.2.3 cycle, n—one forward and back movement of the abradant holder on a Martindale tester. 3.2.4 wale, n—in knitted fabrics, a column of loops in successive courses that is parallel with the loop axes. 3.2.5 NAHM 3 Foot Forms, n—standard forms used in the hosiery industry for sizing garments. 4.1 The fabric specimen is measured by subjecting the garment to a straight line rubbing motion. The endpoint is determined by a specified number of cycles or when a hole appears in the test area (as discussed in Section 11). 5.1 The measurement of the resistance to abrasion of textile and other materials is very complex. 5.2 The resistance to abrasion is affected by many factors, such as the inherent mechanical properties of the fibers, dimensions of the fibers, structure of the yarns, construction of the fabrics, and the type, kind, and amount of finishing material added to the fibers, yarns or fabric. 5.3 The measurement of resistance to abrasion is also greatly affected by the nature of the abradant, variable action of the abradant over the area of specimen abraded, the tension of the specimen, and the dimensional changes in the specimen. 6.1.2 Press Cutter 4, 38 + 1 mm (1.5 + 0.06 in.) and 140 + 1 mm (5.5 + 0.06 in.) in diameter. 6.3 China Marker, used to mark the abrasion testing area around the template. 6.4 Toothbrush, medium bristle toothbrush for use of removing pills during abrasion testing. 7.1 one specimen per garment. 7.2 Evaluate a minimum of three specimens. 8.1 Place the specimens at standard conditions, 21 ± 1°C (70 ± 2°F) and 65 ± 2% RH, for at least 4 hours. 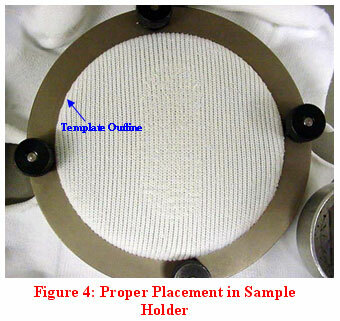 9.1.1 Using the press cutter, create abrading samples for the abradant and sample holders. 9.1.2 Place the 38 ± 1 mm (1.5 ± 0.06 in) diameter abrasive on the abradant holder. 9.1.3 Place the 140 ± 1mm (5.5 ± 0.06 in) diameter abrasive on the sample holder. 9.2 Confirm the Martindale is configured to the straight line motion. 9.3 The head weight should exert 12 ± 0.3 kPa (1.74 ± 0.004 psi) on the specimen. 10.1 Using AATCC Test Method 150, wash and dry test samples three (3) times. When available, follow labeled wash instructions. 10.2 Conduct all tests in the standard atmosphere for testing. 10.3 After conditioning, place the garment on a NAHM foot form. The form size used should represent the maximum size of the garment, as specified on label. 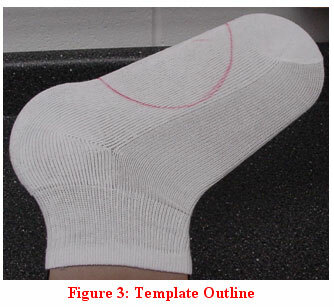 For example, a 9-11 stretch women’s sock should be tested on an 11.0 F (Female) NAHM foot form. 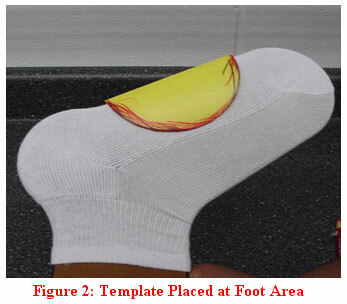 10.4 After the garment is placed on the NAHM foot form, center a circular template (130 ± 2 mm in diameter) between the toe and heel cups of the bottom of the NAHM foot form. The template should be positioned in a manner that it covers both sides of the garment on the NAHM foot form. See (Figure 2). 10.6 Remove the marked garment from the NAHM form. 10.7 Cut test specimens in half so the circular testing area will be one ply and lay flat. 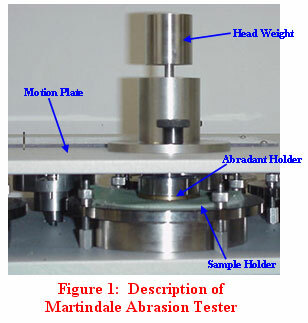 10.10 Place the motion plate on the Martindale abrasion machine. Place the abradant holder and head weight on the motion plate. 10.11 Using the manufacture’s directions, set the batch set counter to 200. 10.13 When the machine stops after 200 cycles, remove head weight, abradant holder, and motion plate. 10.15 Use a toothbrush to gently remove pills of matted fibers interfering with proper contact between the specimen and abradant during the test. Use air to blow off the Trizact® on abradant holder. 10.16 Replace the motion plate, abradant holder, and head weight on the machine. 10.17 Repeat steps 10.10 through 10.15 until an end point is reached. As the endpoint is approached, reduce the number of movements between examinations. 10.18 Record the number of cycles to reach the end point. 11.1.1 Failure—Abrade the specimen until a hole appears. 11.1.2 Specified cycles—Abrade the specimen to a specified number of cycles. Stop the test if a hole appears before the specified number. 11.1.3 Mass Loss—Determine the mass loss as the difference between the masses before and after abrasion. This loss may be expressed as a mass or as a percentage. 12.1 State that the specimens were tested as directed in this test method. 12.2 Describe the material or product sampled and the number of samples used. 12.2.4 Any deviations from this test procedure. where: A = before weight and B = after weight. 13.1 Precision—The precision of this test method for measuring the abrasion resistance of hosiery by the Martindale abrasion tester is being established. 13.2 Bias—No justifiable statement can be made on the bias for abrasion resistance of hosiery, since the value varies in fiber and style characteristics. A1.1 Change the abradant every 10,000 cycles (or after each garment/style is completed) on the abradant holder. A1.2 Change the abradant every 50,000 cycles on the sample holder. A1.3 Perform all three (or more) samples on same head to improve precision. A1.4 Make sure that the abradant is held in place firmly and that there are not tucks or ridges present. A1.5 Every time the specimen holder is taken from the machine to test the specimen or endpoint, make sure that it is tightened properly before it is replaced onto the machine. 4 Available from Testing Machines, Inc., 400 Bayview Ave., Amityville, NY 11701. 5 Trizact™ is a trademark abradant of 3M Incorporated: R.S. Hughes;	www.rshughes.com; 877-774-8443.